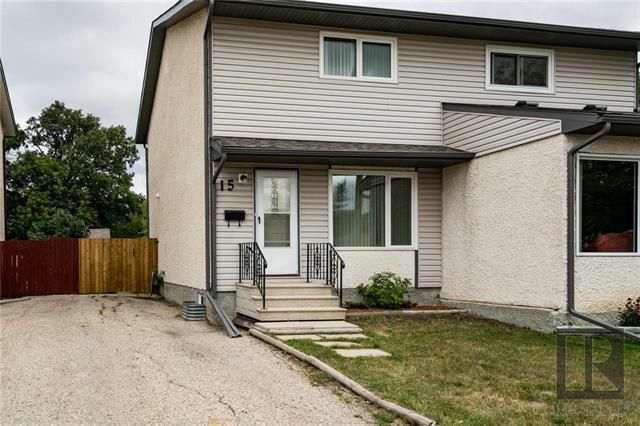 Excellent starter home in immaculate condition on quiet dead end street in St Vital. Spacious layout featuring large living room and kitchen with 3 bedrooms and 1.5 baths. Large master bedroom with walk in closet. Basement is fully finished with rec room plus den or office. Lots of recent remodelling and upgrading which include newer laminate flooring in living room, recently painted interior, remodelled main bath, as well as updated shingles, energy efficient windows, and maintenance free siding, soffits, fascia, and eaves troughs. There is central air. Front drive leads to large fenced yard with patio and storage shed. Excellent neighbours too. Close to public transportation as well as all levels of schools. Don't miss this opportunity! Shows beautifully!